Implementation of the Resolution of the United Nations on the Global Geodetic Reference Frame for Sustainable Development in Latin America (La Plata, ARGENTINA, October 2019). 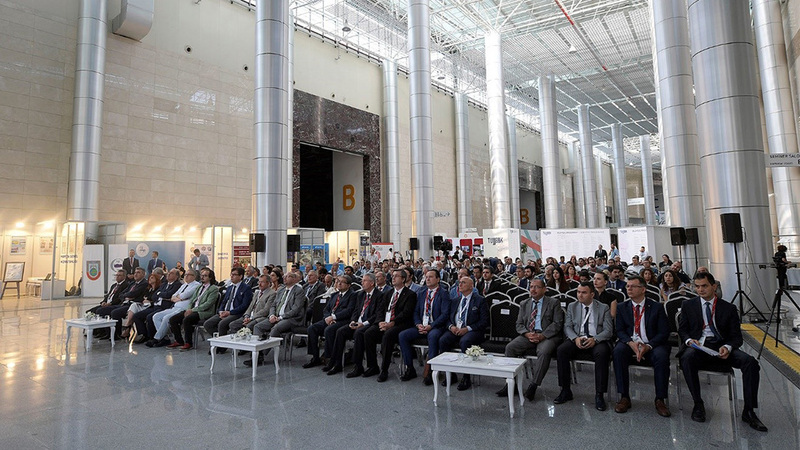 The Scientific Congress of the Turkish National Union of Geodesy and Geophysics (TNUGG) was organized by the General Command of Mapping (the IUGG Adhering Organization for Turkey), Dokuz Eylül University, İzmir Katip Çelebi University and İZFAŞ (İzmir Fair Services, Cultural and Art Affairs) in Izmir, Turkey, from 30 May to 1 June 2018. The Congress enabled scientists from geodesy, geophysics and other related fields to come together and discuss interdisciplinary issues. The event was also dedicated to the centennial celebration of IUGG. The scientific meetings were organized by individual commissions under the auspices of the TNUGG. This congress was the first which was held with the participation of all commissions of the National Union. At the Opening Ceremony, participants of the conference were welcomed by Orhan Polat from Dokuz Eylül University as the head of the Local Organizing Committee. Then Osman Alp, President of the Turkish General Command of Mapping (GCM) of the Ministry of National Defense and head of TNUGG, gave a presentation about TNUGG and GCM’s responsibilities, achievements and products. Alik Ismail-Zadeh, IUGG Secretary General, made a presentation on 100 years’ history and future vision of the IUGG, and on Disaster Risk and Sustainability. In total, there were about 200 participants; 95 papers were presented at 18 oral sessions and 11 papers were selected for poster presentations. The Congress drew public attention to many subjects especially seismology and earthquake risk related topics in the media. For more information: http://www.tujjbkongre2018.org. The Year 2019 is the 100th anniversary of IUGG. The Chinese National Committee for IUGG, in collaboration with IUGG and its Associations, the China Association for Science and Technology (CAST), the Chinese Academy of Sciences (CAS), the National Natural Science Foundation of China (NSFC), Lanzhou University and others, organized a series of activities to promote this centennial event. 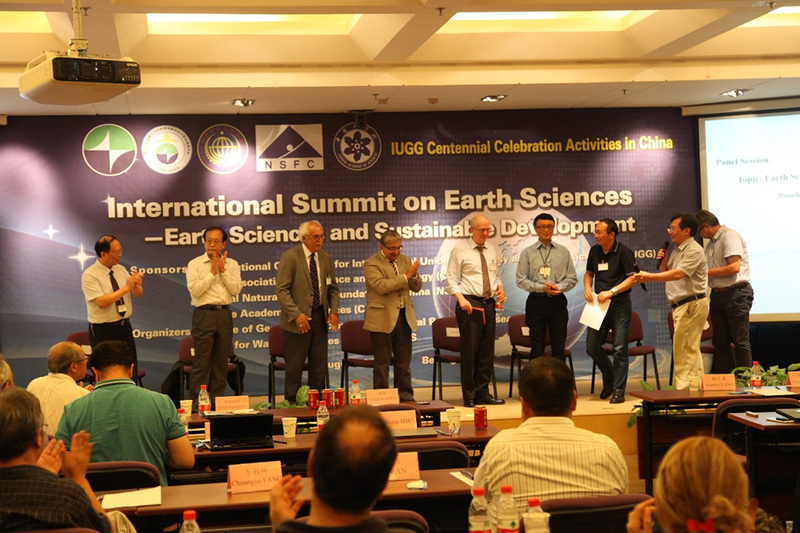 A high-level International Earth Sciences Summit, entitled Earth Sciences and Sustainable Development was held on 21 August 2018 in Beijing, China. More than 20 international scientists and 100 delegates from China and around the world (e.g., Iran, Nigeria, Pakistan) attended this summit, including Alik Ismail-Zadeh, Secretary General of IUGG and Secretary General of International Science Council (ISC); Yuntai Chen, Academician of CAS, IUGG Fellow, and former Member of the IUGG Bureau (2003-2011); Guoxiong Wu, Academician of CAS and IUGG Fellow; Keith Alverson, Secretary-Treasurer of the IUGG Union Commission on Climatic and Environmental Change (CCEC); Teruyuki Nakajima, Secretary General of IAMAS; Deliang Chen, Foreign Member of CAS and former Executive Director of ICSU (2008-2011); Yuanxi Yang, President of the Chinese National Committee for IUGG (CNC-IUGG) and Academician of CAS; Jun Xia, Vice President of the CNC-IUGG and the member of CAS; Xiaofei Chen, Vice President of the CNC-IUGG, IUGG Fellow, and Academician of CAS, Jianping Li, Secretary General of the CNC-IUGG, IUGG Fellow, and Vice Chair of CCEC; and other distinguished participants. Representatives of CAST, CAS, NSFC and CNC-IUGG welcomed the participants at the Opening Ceremony and delivered effusive speeches. The summit consisted of two parts: keynote presentations and panel discussion. Presentations at the summit included Developing Cryosphere Science under Climate Change (by Dahe Qin, China), the Past Achievements and Future Prospects of the Atmospheric Sciences (by Terry Nakajima, Japan), Sustainable Water Management in a Changing Climate: Challenges in the Application of Hydro-climatological Forecasting for Decision Making (by Soroosh Sorooshian, USA); Tibetan-Iranian Plateau and the Asian Monsoon (by Guoxiong Wu, China); Resilience: The science of adaptation to climate change (by Keith Alverson, Japan, UN Environment Programme); Proving Ground for Global Sustainability (by Deliang Chen, Sweden); Applications of Computational Seismology on Hazard Mitigation (by Xiaofei Chen, China), and Centennial of International Cooperation in Earth & Space Sciences (by Alik Ismail-Zadeh, Germany/Russia). In the panel discussion, eight panelists presented their views on Earth Sciences and Sustainable Development, new challenges and opportunities in the future, particularly about interdisciplinary and transdisciplinary research related to U.N. Sustainable Development Goals, about younger scientists and geoscience research in developing countries. All participants agreed that this was a successful Earth Sciences Summit dedicated to the IUGG Centennial celebration activities. This summit not only promoted high-level academic forums of Earth Sciences and presented new prospects for sustainable development strategies, but also provided a very good platform for advanced research strategic consultation, education and talent cultivation in the Earth Sciences. Through this summit, scientists and managers for sustainable development together reviewed IUGG contributions globally and regionally such as in China, the world’s biggest developing country, summarized the advantages of Earth Sciences and their important role in serving society in a sustainable way, and summed up major challenges for the future. The meeting attracted the attention of the Chinese media, such as Xinhua News Agency, the official state-run press agency of China, and Science & Technology Daily. A report on the meeting was published by Xinhua at http://m.xinhuanet.com/2018-08/23/c_129938937.htm. From 22 to 24 August, CNC-IUGG organized the Third Congress of China Geodesy and Geophysics at Lanzhou University, China. More than 1,000 scientists and students attended the event. At the Opening Ceremony, Chun-Hua Yan, President of the Lanzhou University, Yuanxi Yang, President of CNC-IUGG, and Alik Ismail-Zadeh, IUGG Secretary General, addressed the participants in the Ceremonial Hall of the University. The following keynote speeches were delivered at the congress: Atmospheric Heating Source over the Tibetan Plateau and its Climate Impact by Guoxiong Wu; Paradigm Shift in Disaster Science – Transdisciplinary System Analysis with Action-Oriented Research by Alik Ismail-Zadeh; Water Resources and Water Security by Jun Xia. 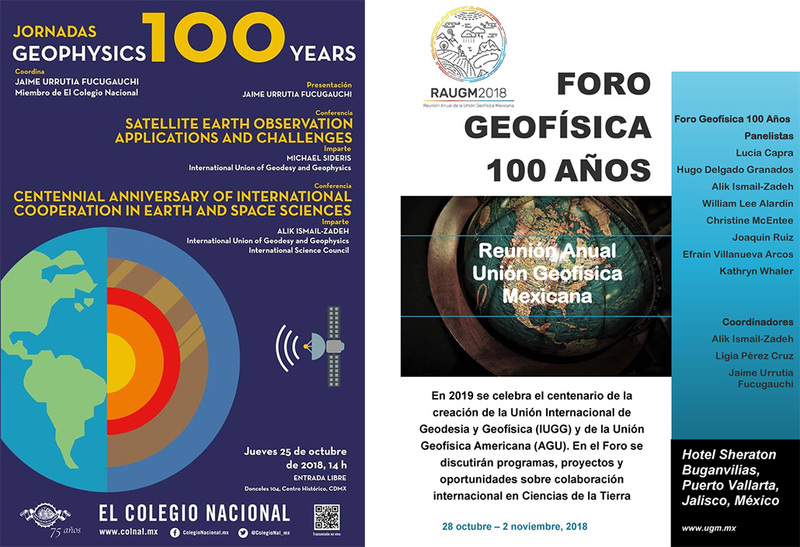 The celebration was continued during the Annual Meeting of the Mexican Geophysical Union on 29 October 2018 in Puerto Vallarta, Mexico. The Plenary Session discussed past development of international geoscience cooperation and future perspectives of the cooperation related to challenging problems of society, involving early career scientists and cooperation between North-South and South-South. Representatives of IUGG (Vice President Kathy Whaler and Secretary General Alik Ismail-Zadeh), the American Geophysical Union (Executive Director Christine McEntee), the Mexican Geophysical Union (President Ligia Pérez Cruz), the Mexican National Committee for IUGG (President Hugo Delgado Granados) and others were among the panellists of the Plenary Session chaired by Jaime Urrutia Fucugauchi.